Embracing a “do-it-yourself” spirit, and, with an often irreverent, anything goes attitude, zines document subjects from the everyday to the out-of-this world. ?#@*$%! THE MAINSTREAM: THE ART OF DIY SELF EXPRESSION, presents 123 zines from Special Collections at the University of Miami Libraries, November 2, 2013 – January 5, 2014 at the University of Miami Lowe Art Museum. 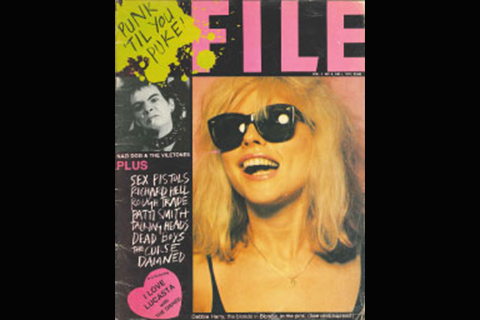 Fanzines—self-published, amateur journals, featuring hand-lettering and original, ground-breaking designs, created by “fans” of anything from science fiction authors to bands to goofy television shows—were first created in the early 20th century but truly took off with the punk rock movement of the 1970s. They embodied the “do-it-yourself” (DIY) spirit of the musical, artistic, and political ethos of punk. Zine topics would broaden throughout the 1980s and 1990s to cover a variety of subject areas, from sexuality to reproductive rights to racial politics, but also embraced more mundane subjects like dumpster diving, alternative fashions, tattoo art, and much more. Despite the flowering of topics, the format and “look” remained comfortingly similar: photocopied booklets printed in limited editions produced as vehicles of self-expression and community-building, often politically “in your face” and not beholden to advertisers or the mainstream reading public. The exhibition presents an in-depth look at six segments of the zine universe. Some of the earliest and best known punk rock zines are featured in “Music,” including the first issues of Slash Magazine, Sniffin’ Glue, and PUNK Magazine, all from the 1970’s. “This World” examines the zine reaction to all things political, from Black Power zines like the first issue of Black Power Speaks (1968) to anti-war zines including Winter Soldier: A Publication of Vietnam Veterans Against the War (1973). “Other Worlds” displays one of the earliest and most popular subjects for zines, science fiction, with 11 Sci-Fi fantasy zines from the 1940s and 1950s exhibited along with conspiracy theory tracts like Communism, Hypnotism and the Beatles (1965) and The Astronauts Did Not Walk on the Moon (1972), among others. Personal worlds and self-discovery are explored in “Sexuality,” “Art & Culture,” and “Me, Myself & I.” The power of zines to express complex examinations of sexuality and societal roles is seen in publications like Are You a Boy or a Girl? (2010), Time Warped: The Queens College Rocky Horror Fanclub Newsletter (1978), and Epic Moments of Personal Failure (2011). The exhibition also includes an enlightening description of what zines are and what they are not, as well as historical notes on pivotal zines and zine producers. Visitors will be able to further immerse themselves in the world of zines in the Zine Lounge, where reading copies of many of the publications featured in the display will be available. On Saturday, November 16, 2013 from 1 p.m. – 3 p.m., the Lowe Art Museum will present Zine-O-Rama, an immersive zine event, which will include a curator’s talk, selected zine readings, a guided exhibition tour, and collective zine-making. A complementary exhibition, Flori-zines: Underground Views of the Sunshine State, featuring zines from Florida, with an emphasis on zines and their makers in Miami, will be on view, from November 4, 2013 - January 31, 2014 at Special Collections, Otto G. Richter Library, located at 1300 Memorial Drive, 8th Floor. For more information on this complementary exhibition and it’s associated programming, visit: http://library.miami.edu/specialcollections/. ?#@*$%! the Mainstream: The Art of DIY Self Expression is curated by Cristina Favretto, Head, Special Collections, University of Miami Libraries, and Kara Schneiderman, Assistant Director, Lowe Art Museum. Lowe Art Museum exhibitions and programs are sponsored by Beaux Arts, Friends of Art, and the general membership. Support for the Lowe Art Museum is provided in part through a grant from The Miami-Dade County Department of Cultural Affairs and the Cultural Affairs Council, and the Miami-Dade Mayor and Board of County Commissioners.